Springtime for Venture - Are IPOs Back? The Flickrs For Video - Why YouTube? Web 2.0 Is Over - Did You Miss It? Bill Gates Web 2.0 Memo ... The Wolf is Back! 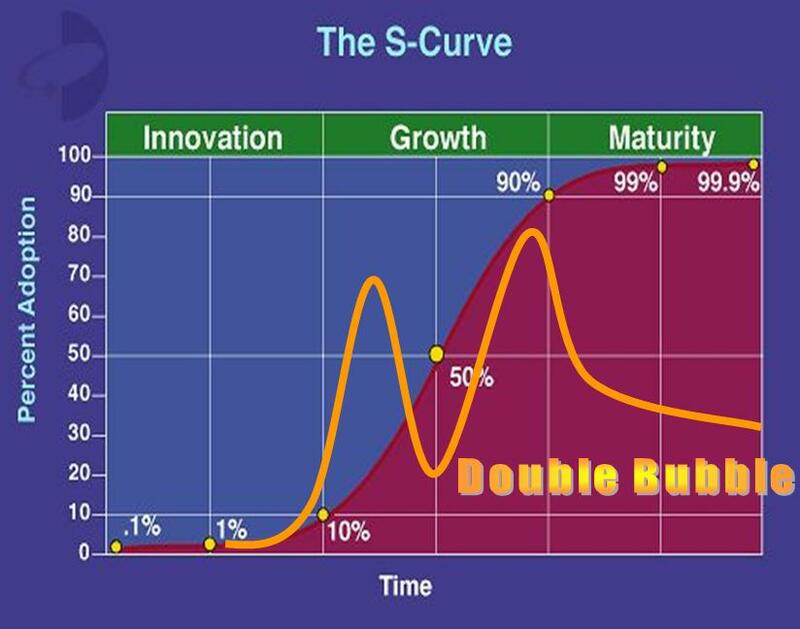 The question of when to jump in to digital media investments is only partly answered by the Double Bubble analysis. The way to play these opportunities is also related to the market structure and to the venture's leverage or market power. Laid out in this post is one model that is a shorthand for the relative power of the industry structure vs. any particular venture. The various industry types can be simplified to a Rule of N, meaning how many likely winners emerge after the war of attrition in the early going. Like all such models, exceptions abound, but it does provide guidance for when to jump into a new venture based on likely resulting industry structure. Rule of 1 ventures: invest early, before the leader emerges. Use marketing to create the leader. Rule of 2 ventures: invest late, often very late. Pick the leader. Rule of 3 ventures: invest late. Pick #1 or #2, or get out. Rule of 5 ventures: invest early, based on IP/hits and distribution scope. The three rules of real estate are widely known: location, location, location. The four rules of venture capital remain a mystery to most: too early, too early, too early, too late. Case in point: digital media. A number of funds were formed to do digital media deals a decade ago during the Info Superhighway craze that led to Big Telcos romancing Hollywood. As they say, a shotgun wedding. It ended badly, and these funds performed poorly. One wants to invest when the trend is clear, but before the herd drives value up. Are we there yet with digital media? The answer seems to be yes. It will be seen as the second Internet Bubble, and should be fast and furious once underway, perhaps as soon as 2007-8. To understand why, consider the Double Bubble phenomenon of technology innovations. Yelnick's description of the "search for intent" in the Grokster decision as "chilling" has a strong resonance, especially for ISPs, with the decision last week of the Australian Federal Court in Universal Music Australia v Cooper. The Grokster decision held that Grokster and Streamcast were not protected by the Betamax decision and were potentially liable as having blatantly induced copyright infringement. The initial view held that Hollywood won, but that view has given way to a belief that the Betamax decision was reaffirmed and even expanded. The truth is in between. The Betamax decision was expanded by finding that instead of imputing intent to infringe from infringing use, a higher standard of actual inducement was necessary. But - there is always a but - the new inducement test may create a chilling effect for a period of time until it becomes clear (after other cases) that a fairly high standard of intent is required. In Betamax, the Court borrowed from patent law on contributory infringement to create the "substantial noninfringing use" defense. In Grokster, the Court borrowed from patent law to create a new test of inducement to infringe. Inducement is a subjective question of intent, and can be shown from internal emails not just external marketing messages. So copyright now evolves from an objective, strict liability doctrine to a subjective, search-for-evidence area of law. The concurring opinions appear to expand Betamax by allowing fairly minimal legitimate use to offset infringing use. And they make it clear that merely knowing of substantial unlawful use does not take one out of the Betamax safe harbor. What takes the technology provider out is the intent to induce infringement. Often the stated principle of a case is less important than the footnotes. Grokster has footnote 12, which says "in absence of other evidence of intent, a court would be unable to find contributory infringement merely based on failure to take affirmative steps to prevent infringement, if the device otherwise was capable of substantial noninfringing uses." Fair enough. But what if copyright holders ask the technology provider to modify the tech to limit infringement? Lack of response might be construed as evidence of intent to induce infringement. The search for intent is rather chilling. The post-bubble ritual punishment of bad CEOs hung people such as Frank Quattrone on as little as one ambiguous email. Could a new technology be shut down due to an overzealous middle manager's emails? The Court uses words like "purposeful" and "clear" to describe the level of intent that rises to unlawful inducement. This is a high bar. Let's hope the lower courts apply the higher test and reduce the chill. But that will take some time and a few cases. The net net is yet another set of prophylactic procedures, to dumb down marketing messages and get marketing managers off email (IM anyone?). Copyright holders will try the 'please modify' letter to create a trail of intent where none may have existed. Google has already backed off its video service a bit due to complaints from content companies. And the use of "-ster" in the name will go away - the very name Grokster, riffing on Napster, was evidence of intent. Or: don't ask, don't sell. filme on Bill Gates Web 2.0 Memo ... The Wolf is Back! Fleetejaize on What Replaces the Browser? Blogs! ?